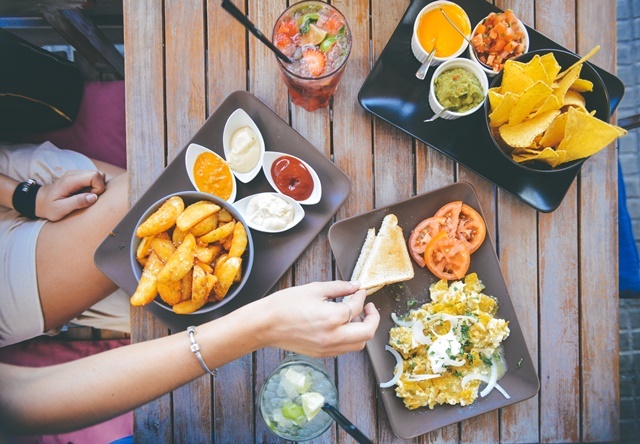 Going out to dinner with friends and family is a special treat we all enjoy – the good food, the good company and especially, not washing up afterwards – but it can be difficult to stick to a healthy diet when faced with an abundance of menu choices. Many restaurants now have their menus online, so you can easily research beforehand. Some establishments will even have the nutritional information of the menu items listed, so you can calculate ahead of time how many calories you are likely to consume. Plan ahead to avoid impulsive choices. If you see a dish you would like to try, but the protein is fried, ask for it to be grilled, or if the side is French fries, ask for a salad or for vegetables instead. Most restaurants are more than happy to keep their customers happy. When reading the menu, look out for words like “pan-fried,” “crispy,” “dipped,” “scalloped,” “gratin,” and “alfredo.” These dishes are likely to have a lot of sodium and trans-fats in them. Rather order dishes with words such as “grilled,” “steamed” and “baked”. Order a tomato or stock based soup for a starter, instead of a heavy cream based one, or even better choose a delicious salad but remember to ask for the dressing on the side. If ordering soup, ask the waiter for no bread as once it is on the table, all resistance may crumble! White rice dishes such as steamed jasmine rice or rice pilaf are better than heavier risottos, but even better ask for brown rice or other grains like quinoa or couscous. A good option is to ask for a baked potato with a small dollop of sour cream and chives. Avoid ordering salads with a creamy sauce such as coleslaw or potato salad, and skip the added bacon bits or crispy croutons. If you’re at a buffet, pile your salad plate with raw vegetables like carrots, cucumber or broccoli and add marinated vegetables such as olives or roasted red peppers. Concentrating on what is on your plate often means that the calories in what you drink are forgotten. A glass of wine is a better choice if you are going to be drinking alcohol, as mixed cocktails can often contain 300 calories per glass. The best option is to drink water before and during your meals, and stick to one glass of wine.